Stay at the Radisson Blu Mustcat and enjoy modern and spacious rooms, a range of dining options and a centrally located hotel. 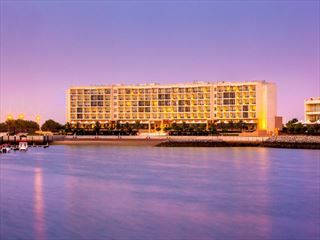 The Radisson Blu Hotel, Muscat offers 153 guest rooms and suites ideally suited for business and leisure travellers. Each room features stylish design and convenient amenities like mini bar and laptop-sized safe. Standard rooms offer the best in comfort and convenience, equipped with direct-dial telephone with voice mail, Free high-speed, wireless Internet access, mini bar, trouser press, individual climate control, laptop-sized safe and cable television. Maximum number of guests 2 adults & 1 child. Suites are ideal for families with a separate lounge area overlooking the mountains. Maximum number of guests 3 adults, or two adults and two children. 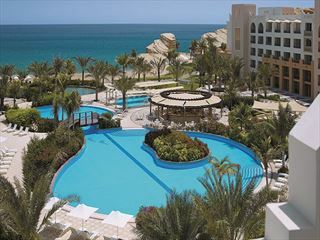 This all-day Muscat restaurant features a tantalizing buffet as well as an à la carte menu. Enjoy lavish daily breakfast and lunch buffets, along with seafood and BBQ Bazaar dinners. Among Oman restaurants, Al Tajin Grill is renowned as Muscat’s legendary steakhouse. This Muscat restaurant boasts fine steaks and fresh seafood in an atmosphere reflecting the grandeur of Oman’s historic forts. Enjoy a wide selection of beverages and delectable snacks at this on-site jazz bar in Muscat, featuring a jazz and blues pianist. 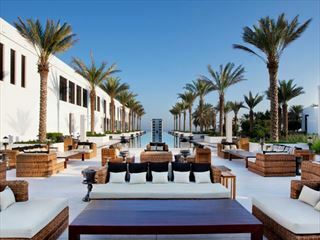 The Lazy Lizard boasts an open-air garden bar ideal for meetings with colleagues and friends at this Oman hotel. Stop by the bar after a long day in Muscat and savour cold refreshments, including juices, cocktails, draft beer and several international drinks, as well as light snacks. A popular spot among guests and locals, the Cellar Bar hosts a live band (except Saturdays) featuring popular radio hits. Offering a lively atmosphere, the bar serves an extensive international drinks menu, along with an à la carte menu of bar snacks. Millenium Resort Mussanah in Oman is loacted in the Batina region 45 minutes from Muscat international airport. This incredible resort has its own private 54 berth marina, nestled directly on the coast of the Gulf of Oman and has good accommodation for families.